This simple recipe calls for the simplest of ingredients. Combine cooked salmon with some mashed potatoes and herbs, shape into round cakes and pan fry till golden brown. Tastes awesome with tartar sauce and hot sauce if you like it spicy. A versatile dish, it can be served as a starter, as a light lunch with a green salad, inside toasted buns with veggies and tartar sauce as a burger. Here are some serving suggestions and variations of the basic recipe. Add mashed peas and leeks to the mixture before shaping and cooking, for a flavor variation. Substitute chives for dill, omit ginger and add some Parmesan cheese to the mixture. Dust the fishcakes with flour, dip in some whipped egg and then coat with some flaked almonds before frying. Make these with tuna, haddock or cod instead of salmon. 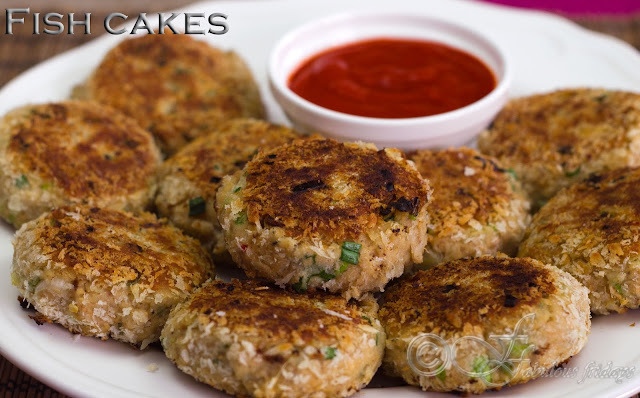 Make small sized fish cakes and serve as a starter with your choice of dip. They taste awesome with tartar sauce or if you like it spicy, sriracha sauce. Serve with a poached egg on top drizzled with Hollandaise sauce. Serve these inside toasted buns with onion, tomato and lettuce with a drizzle of tartar sauce as a burger. Serve alongside salad greens as a light lunch. Cooked fishcakes are perfect for freezing. Put them in a freezer friendly box with parchment paper separating the layers. When you defrost them, lay them out in a single layer so that they don’t get soggy. Heat them in the oven at 400 F till heated through and crisp. For the cooked salmon you can poach fresh salmon fillets and then flake them or use canned salmon. Place all the ingredients in a bowl and gently mix together to blend all the flavors. Do not over mix. Divide into 10 portions and shape into 1/4 inch thick patties. Heat oil in a large skillet over medium heat. Cook the fish cakes in batches until they are golden brown on both sides, and the fish cakes are hot in the center, 3 to 4 minutes per side.